Welcome to Pine Crest Campground, a friendly campground featuring nearly 20 acres of beautiful woodlands and fields, along with a half mile of frontage on the Susquehanna River. Our sites are very spacious, with your choice of shade or sunny areas, and full hookups available. Our boat dock offers direct access to the best in boating, fishing and water sports, so be sure to bring your boat, water skis, jet ski, canoe or kayak … as well as your fishing equipment! 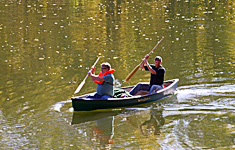 The river offers miles of boating pleasure and game fish that include Muskies, Bass, Pike and other species. 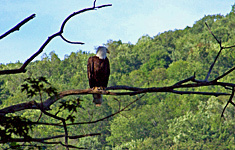 If you are lucky, you will also catch a glimpse of one of our four resident Bald Eagles fishing on the river. Our philosophy is to provide families and friends with a relaxing atmosphere where they will enjoy the freedom to spend their vacation time as they see fit. From weekenders to empty nesters to young families to seasonals, we will do our utmost to care for your particular needs. Whether you choose to relax with a good book while enjoying nature, or prefer a more active lifestyle that includes bicycling, boating, kayaking or canoeing, we’ve got you covered! Pine Crest is located in New York State, less than 2 miles North of the Pennsylvania line. Access is easy, just 14 miles from Interstate 81 (in Pennsylvania) and 6 miles from Interstate 86 (in New York - also known as Route 17). Please accept our invitation to join us this season … to relax, unwind, and enjoy the beauty of Pine Crest Campground. © Pine Crest Campground. All rights reserved. Bald eagle photo courtesy Zach Siedlecky.